We Heart Mac and Cheese: We Heart Mac and Cheese Turns 1 on June 22nd! We Heart Mac and Cheese Turns 1 on June 22nd! Suz and I can scarcely believe we've spent the last year cooking, eating and blogging about mac and cheese and we're still alive! Yay. This calls for a celebration! As a token of our appreciation for your continued readership, comments and virtual thumbs ups, we're giving away a set of *adorb* macaroni and cheese candles (pictured above.) And that's not all. One lucky winner will walk away with some groovy Goodbye Detergent! brand Original Spaghetti Scrubs! The scrubs, made with corn cob fiber and peach pit fiber, are eco friendly and look almost good enough to eat (but we don't recommend it.) In the Clean Kitchen Set, you'll get one coarse Spaghetti scrub, one gentle Spaghetti scrub, a kitchen cleaning pad for stainless steel, two heavy duty kitchen cleaning pads and a plate scraper that's just perfect for scrubbing mac and cheese encrusted pots and plates. 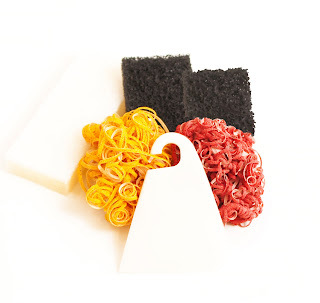 Get more info at goodbyedetergent.com. Enter the sweepstakes by leaving your name and a comment on this post. 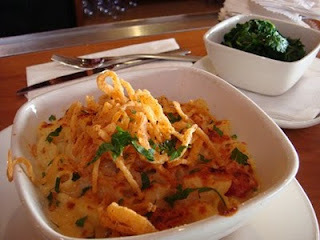 List your favorite mac and cheese recipe or tell us the best spot for dining out on mac and cheese in your area. Winner will be selected at random and announced on our actual birthday, June 22nd. If you don't have a Blogger account that automatically includes your email address, please send us an email at weheartmacandcheese@gmail so we can contact you if you win! But wait, there's more. In honor of this momentous occasion, we've gone through old posts and compiled a list of our favorite recipes and restaurant fare. These are the crowd pleasers and award winners. 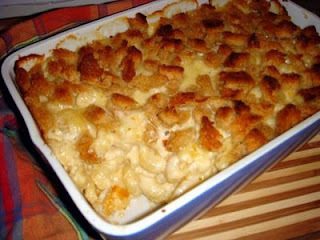 1) Martha Stewart's Macaroni and Cheese - The gold standard, this recipe never disappoints. It's rich, gooey and decadent. 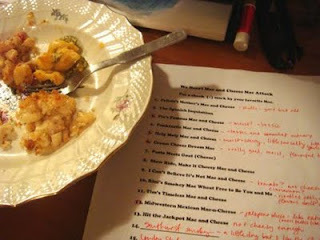 4) Holy Moly Macaroni and Cheese - Jessica Raymond's recipe tied for the top slot at the We Heart Mac and Cheese Pot Lock. A spin off of Martha's mac with the addition of chipotles in adobo sauce as well as some other genius adjustments, it was spicy and delicious. 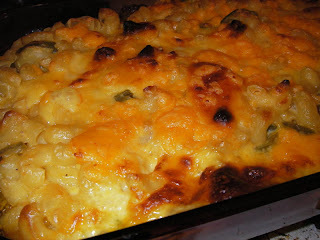 5) Herby Havarti Macaroni and Cheese - I've made this recipe four times in the last couple of months. It's that good. 6) Cheese Drawer Mac and Cheese - This is what happens when you have a lot of cheese odds and ends lying around in the fridge. 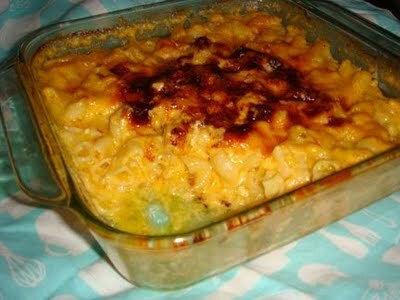 I created this delicious mac with leftover cheese nubs to rave reviews. 7) Amanda's Midwestern Mac and Cheese - Amanda William's mac placed third at the We Heart Mac and Cheese Pot Luck. With big ol' hunks of Jalapenos scattered about, this mac has a little spicy zing and some kind of illegal substance that forced me to keep eating it even though I technically should have been full. 8) Honorable Mention! Macaroni and Cheese Cake - A mac and cheese dessert. To be fair, it’s not a traditional cake in that it does not contain any flour or leavening. It’s more like a crustless macaroni pie. 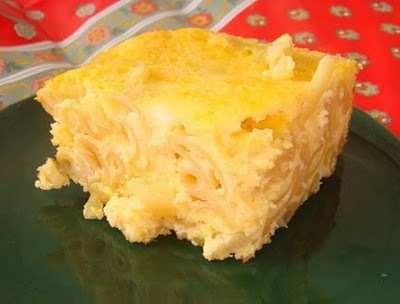 It reminded Suz of noodle kugel except that the cheez powder made it fluorescent orange. 1) Comme ça - We don't care what anyone says, the mac and cheese at Comme ça is magnifique. 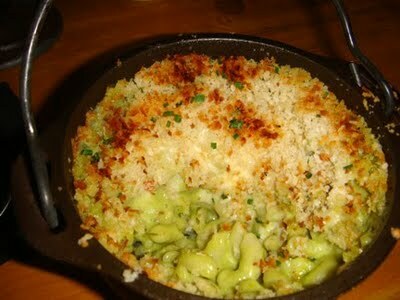 2) Roaring Fork in Arizona - This macaroni and cheese is so very satisfying. It’s got the perfect balance of sauce, noodles and crunchy crumbs and would be a strong contender for the weheartmacandcheese crown, even without the magical addition of green poblano chiles. 3) Truxtons - I thoroughly enjoyed Truxton’s Kicked Up Mac. The sharpness of the blue cheese really won me over. I look forward to dining there again, probably on a Monday evening when wine sold by the bottle is half-price. 1) Comme ça - No contest! See Suzy's picks above. 2) Hugos - While the texture would have benefited from a little crispy breadcrumb crunch, the sauce was extremely creamy, and there were tiny pieces of tomato mixed into each bite lending a hint of "acid" (check me out with my cooking lingo, thanks Top Chef!). The menu was kind enough to identify all the cheeses so we didn't have to pretend our palates were that sophisticated. A combo of Cheddar, Gorgonzola and Parmesan give this mac and Cheese a serious punch. 3) Beechers in Seattle - Deemed "The World's Best Mac and Cheese," on their website, Beecher's mac and cheese is made with 1 lb. of Beecher's Flagship Cheddar cheese and 1/2 lb. Beecher's Just Jack cheese. Some cheese sauce is overly watery, requiring a veritable noodle lifeguard to rescue the pasta from a soupy current. Not the case here. It didn't even feel like "sauce" but rather a coating of deliciousness on every noodle. Now it's time for you to tell us your picks and WIN!! After reading the May 10 issue of Saveur I tried the Artisanal Macaroni and Cheese recipe just last night - turned out great. Wish I was near NY so I could try the real thing! DVR Life - I went to Artisanal last time I was in NY and the mac was indeed delicious! Thanks for sending the recipe. Renee, Becky and Caroline thanks for posting! Make sure we have a way to contact you in case you win. You can send us an email to weheartmacandcheese@gmail.com. Thanks! "...this recipe never fails to disappoint." "...this recipe never fails to amaze." Okay--I have to go with Jessica's mac-n-cheese. True, I have not yet made it but of them all it seems to be the best of what I like in a mac-n-cheese. Congratulations on being a year old! Quite a milestone. Now....for the best mac-n-cheese in MY area.....would probably have to be the Seafood Mac-N-Cheese at Julianna's on Watch Hill Road in Cortlandt Manor, NY. 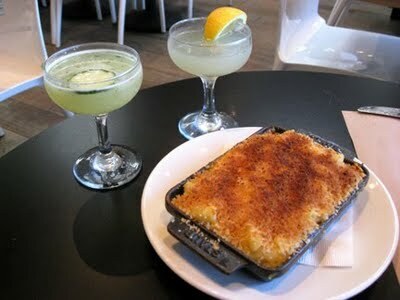 A perfect proportion of seafood (scallops, shrimp and loster) to mac-n-cheese -- WITH truffle oil on top. Sinful and delicious!!!! I really like Emeril's recipe (you can find it on the Food Network website under "Em's Mac n' Cheese." I tweak it a little bit now and then by varying the cheeses, and I find that I like it the best with very strong cheese and the spices he recommends, or with milder cheeses and no spices.